Middlesbrough head coach Aitor Karanka says he has not spent extra training time on improving the side's defence. Boro have conceded 26 times in 16 league games this term - the fourth-worst record in the Championship. The Teesiders occupied the same position in the division's rankings last term, when they leaked 70 goals. "No, we have not been concentrating on our defence. I was a defender and we never trained like that, attack as a team and defend as a team," he said. Middlesbrough have conceded in 14 of 16 Championship matches this term. On Boxing Day 2012, they sat third in the table the season's midpoint having kept six clean-sheets and picked up 44 points. Since then, Boro have managed just five shutouts and 28 points in 39 league games. Last weekend, the Spaniard endured a difficult baptism as Boro were forced to play over half their game at Leeds with 10 men after goalkeeper Jason Steele was sent off for fouling Dexter Blackstock. scoring both of their goals from corners. 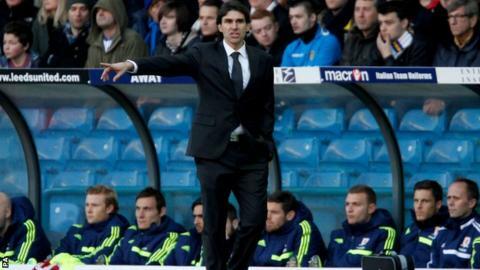 "They were disappointing goals to concede, yes," Karanka told BBC Tees. "But these are mistakes we need to cut out, not just say that the the defenders and midfielders must improve their defending. "Our attitude was good against Leeds, but we must improve our concentration to make less mistakes, not put extra focus on the defence." The Reopuiblic of Ireland international has signed a one-month loan deal at the Riverside.